As of January 1, 2007, Washington State law permanently banned both residential and land-clearing burning within city limits and their urban growth areas (UGAs). Recreational fires are still allowed by state law. How do I know if I live inside an urban growth area (UGA)? What kind of fire can I have on my property? Recreational fires – These fires consist only of charcoal or untreated firewood in an approved enclosure and are used for cooking or pleasure. All recreational fires that are larger than 3′ feet in diameter and 2′ feet high require a permit. Residential fires – If you live in an area where open burning is allowed, these fires consist of leaves, clippings, prunings and other yard and garden debris that are generated on site. If your fire is smaller thatn 4″X4’X3′ you can call the burn information line to receive an automated verbal burn permit. If you are planning on having a residential fire larger than 4″X4’X3′ you can get a written permit for a residential burn pile up to 10’X10′. This permit is available by pre-inspection only. 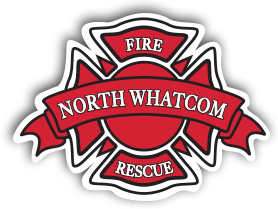 To request a burn permit or to find out if you need one, call the Whatcom County Fire Marshal’s Office by calling the burn information line at 360-676-6934 to get up to date information on obtaining a burn permit or stop by the Permit Center located at the corner of Northwest and Smith Rd. For more information on state laws and clean air regulations regarding open burning visit: http://nwcleanair.org/, click on air quality programs then outdoor burning.